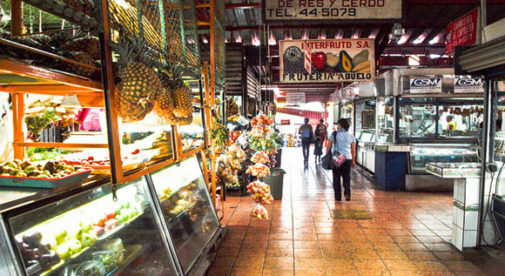 Eating like a local is one of the best ways to keep your cost of living low in Costa Rica. And for dining out that means frequenting your local soda, the equivalent of a diner or neighborhood restaurant in the U.S.
At first glance, seems boring… bland. Rice and beans is rice and beans, right? But each soda does it a little different, adding their own special touch. My hands-down favorite restaurant serving comida tipica (traditional food) is Rancho Nelson in the Central Valley town of Grecia. They add fresh avocado slices and a savory casserole of either chayote or potato, depending on what they cooked up that day. They serve very generous portions. I usually have enough to take home. Just $5. As an added bonus, it’s a family-run place, like many sodas. Kids do homework at one of the tables while mom works the kitchen. An uncle mans the register. And the family patriarch—since passed away—watches over everything from family photos on the wall. Come in more than once and you get a friendly handshake and greeting every time you walk through the door. We recently tried a new soda in Santa Cruz, a town in the northwest corner of the country, near the Pacific coast. We were in town running errands when we spied a rustic looking building just off the main road. Farm implements hanging from the walls… mismatched plastic chairs… crowded with locals, all regulars who shouted their order as they walked in… All good signs. What made the difference here was the sauce: it was a little sweet and a little spicy—scientifically formulated to liven up rice and beans! I couldn’t resist. I asked the waiter if I could take home a bottle. He wouldn’t betray the secret but let on it was a mix of white wine, cilantro, hot peppers, and spices. As we paid the bill he dropped off an old wine bottle full of sauce—$5—just made in the kitchen. It’s had an honored place at my dinner table since then. Skip the soft drinks. Try a refresco natural, tropical fruit mixed with ice, water, or milk. You can usually get pineapple, blackberry, or strawberry. But why not be adventurous and try guanabana, tamarindo, or cas—tropical fruits you really don’t see much in North America but are sweet, refreshing, and delicious. Not every soda is special. But do some searching. Once you find your place you’ll go back again and again.